This is the first time I saw this vegetable. The label stated China Red Carrot. I thought it must have texture like carrots and pink in colour like the skin. 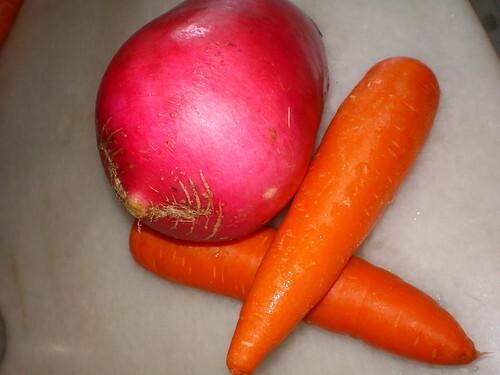 However, it turned to be radish and not carrot. Oh well, in Hokkien, we call carrots, ang chai thau (red carrot) and radish, pek chai thau. Therefore, they must have made a wrong translation. Since I ended up with a huge root vegetable like that, I cut it into chunks and make kiam chye boey with it. My kiam chye boey is so delicious with the radish because it does not have the ‘earthly’ smell like our local white radish. Now, I wonder if I can make radish cake with this? It will be a breeze to grate them and the pink version does not have as much sap/juice like the white one. Anyone has suggestion how to prepare this root vege other than boiling it with pork ribs and make soup? Care to teach? Hehehe, I am a total jakun and yet reluctant to ask the next auntie at the aisle what these vegetables are because I fear looking like a dumb housewife. Anyone knows how to cook this?